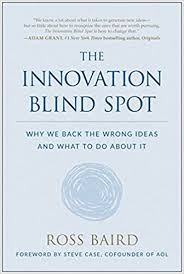 The Innovation Blind Spot was written by Ross Baird. Mr. Baird discusses the idea that most innovations and companies that are VC (Venture Capital) funded are in locales such as Silicon Valley and New York. “Blind spots” could be places in the middle of the USA; fly-over country. Places like Oklahoma. Another key issue discussed is the innovations that get backing. Typically, they are technology oriented. Mr. Baird poses the idea of backing innovation with a social cause in mind while maintaining a for-profit status. A micro financing company to serve a blighted area would be an example. This would be different from what he describes as two-pocket thinking. One pocket being company profits, the other is the philanthropy pocket. Mr. Baird says the best ideas may come from your team. This is because you are utilizing the thoughts and experiences from many people and not just a selected few, if any. He recounts the Kodak story in which the leaders believed that nobody would ever want to view a photo on a screen, so they did not pursue the idea of digital photography. The idea was originally generated by a Kodak employee. Conder Business Solutions believes the team concept is ideal for problem solving and innovation. He also discussed an entrepreneurial ecosystem so that a community has a pipeline of entrepreneurs and ideas. A new start-up business does not necessarily fit well with the owner of an existing business. However, having a pipeline of ideas to improve and grow your business should fit well. It may be difficult for an existing company to change to a purely social impact company. However, steps could be taken in that direction. One area to explore would be your hiring practices. Would you give a person that has a criminal background a chance? Perhaps your company could support important social issues like homelessness and education. Being philanthropic is still good, even if it is two-pocket thinking. Let us know how we may be helpful to you.